But, before the updates, I wanted to talk a little bit about my goals. Mission statement? Vision? Hmm… I guess goals is the word. What I’m trying to say is, I know what I want my life to be about, and I want my writing (and this blog) to reflect that. I think it’s important to have big goals. That way there’s direction in life. And while I’ll always want to tell stories, I think I need a reason for wanting to tell stories. Why am I spending thousands of hours of my free time (not to mention bearing the emotional burden) for these stories? Well, I have an answer. I want to be a part of telling stories that build empathy and increase understanding. Having compassion and building understanding for the underdog has always been a strong driver for me, and my stories reflect that. And I truly believe that literature (particularly speculative fiction like fantasy and science fiction) has an amazing power to build empathy. But I’m a writer with one perspective. There are many, many perspectives out there, and honestly there are some stories I can’t tell. But there are people who have the lived experience to tell those stories, and I want to help them do that. So, that brings me to my smaller sub goals (they are still pretty broad, mind you). I want to tell the stories I can tell in interesting and nuanced ways. I want to do whatever I can to help other people, particularly those of marginalized communities, tell stories. With these goals in mind, I’ve started adding new kinds of posts to my blog. Maybe you’ve noticed? Well, if not, here’s what I’ve started to do and will continue to do. Some of you know I’ve been semi-active on Goodreads for about a year now, and I’m going to start sharing my book reviews here. Reading is a true pleasure of mine, and the idea of sharing the books I love with you all is really exciting to me. Also, going back to my goal, I think the more I can do to help people get their stories out, the better, and reviews actually do help with marketing (or, so I’m told). I’ve also recently joined an indie author group and it’s been AWESOME! It’s so nice to see and read what other people are producing. This community is so welcoming and supportive. In support of my new-found community, I’ll be posting Indie Spotlight blog posts, which will highlight a recent indie book I’ve read. I have to spread the indie love and connect great authors with an eager audience! 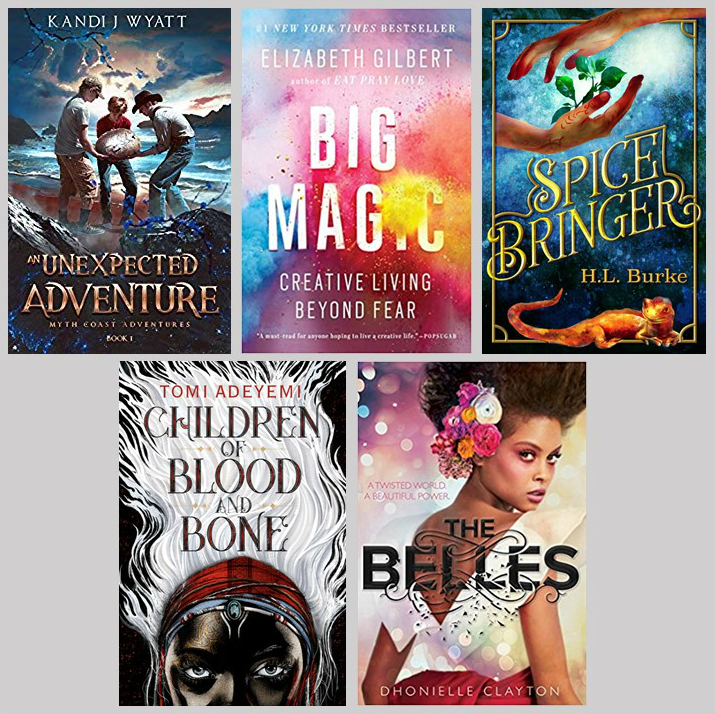 Books I’ve read recently: An Unexpected Adventure by Kandi J Wyatt; Big Magic by Elizabeth Gilbert, Spicebringer by H.L. Burke, Children of Blood and Bone by Tomi Adeyemi, The Belles by Dhonielle Clayton. Speaking of blog posts, I’m going to try to stick to a more regular schedule. I’m going to plan to post something (whether it’s just a small thing or a bigger post) every Tuesday. So, keep your eyes peeled for more regular posts from me! Now, going back to my goals and wanting to help other writers to the best of my abilities, there are a few things I know I can do for people, things that I am comfortable doing and actually have a skill set to match. If you’re a writer (or know one) looking for an extra set of eyes, check out my services list below and let me know if I can help you out! Right now, I don’t have a ton on my plate and am available for most anything! Beta Reading: I have been wanting to be a regular beta reader for a while now, but as you may be aware, I have a serious introversion problem and don’t have a lot of writer friends. I know, it’s not good. But I’m committed to diving in. I know that I always appreciate feedback from beta readers, so that’s what I’m going to do. I’ve already committed to finishing a 170,000-Word epic medieval non-historical non-fantasy novel (I know, weird genre) and I’m loving it. I’m hoping to add a few more to my list later this fall or early winter. Critique Partner: I’m also on the hunt for finding a critique partner. I am writing a book and I know I could use help on it. And I’m sure I’m not the only person who does. So, if you’re looking for a critique partner, let me know and we can see if we’re compatible! Marketing Help: Look, I’m not saying I know a lot about marketing. But I do know reviews help and shares on social media help. If you’ve got a book coming out and could use a little extra help spreading the word, let me know. I’m not saying I’m a social media star, but I am a person with a phone and two thumbs… and a blog! Proof Reading: So, for my day job I’m a technical editor and that means I’m very well-trained in (and pretty good at) line editing. Granted, most of the stuff I look at are engineering reports and scientific evaluations, but there’s a lot that translates to fiction. So, if you’re looking for a second set of eyes to help polish a draft, send me a smoke signal (personal message works, too). So, yes. I’m really hoping some of my skills will be helpful to someone. I’ll create a new page on the blog (and my Tumblr) listing out my services. And now the work-in-progress update. I’ve been working regularly on Footfall for the last 8 months or so. No lie, it is slow going and sometimes I take long breaks. I try to write in the morning, but it’s usually between 250 and 500 words. I’m ecstatic if I can get out 1,000. But, I do like the story a lot. Like, there are times when I think about a scene, and I’m like “Dang, that was good. I’m going to cry!” I know I’ll need to do a significant amount of editing for characterization consistency, dialog, and language in general. I’ve been so focused on plot that a lot of other stuff is slipping through the cracks. But my goal is to finish this draft by my birthday. I think that’s doable. And really, I’m just so excited to see the final story. I think if I wasn’t writing it, I’d really want to read it. Is that immodest? Well, oh well. 🙂 And I’m toying with the idea of putting character bios on my Tumblr. So, if you don’t follow me on Tumblr, you should. OK, that’s my update. Keep your eyes peeled for future writing updates, book reviews, and writing advice posts (yes, I know I’ve fallen off of those, but I intend to do more in the future). Now, how are you guys doing? How was your summer? Read any great books I should add to my list?